Is 'Deathiversary' Actually A Word? I am kind of obsessed with words that should exist but don’t (or that don’t exist in English, at least). I’ve had more moments than usual over the last few months when I found myself reaching for these sorts of words and, of course, not finding them. The very nature of these words is that they aren’t words at all, they don’t exist. But the absence of the word can feel like a presence in itself. The very act of reaching for the word and never finding it can feel a bit like reaching for the person you love and finding they aren’t there, picking up the phone to call them and realizing there is no one to call. The absence of these words is a reminder of the limited language of grief. It somehow seems to speak to the nature of grief, an experience that is both completely life-changing and consuming, yet feels impossible to articulate. A few weeks ago my dad’s deathiversary came and went, a time of year that always involves reaching for a word only to find a void. Deathiversary . . .crapiversary . . . angelversary . . . death anniversary . . . whichever you prefer (and many more options abound) none ever feel quite right to me. And as much as I want a word, something to easily explain to people why there is a cloud hanging over me on a certain day of the year, it feels almost appropriate that there is no real word for a date marking the creation of a hole in the universe. Me: “Ahh, you’re right! We should definitely take a trip to celebrate!” (long pause of revelation as I considered what else happened during my 18th year, the year she and I became friends) “You know what else that means? It is my half and half year of my dad dying”. There is no word for the year someone has officially been part of your universe for half of your life, and there is no word for the year someone has been gone from your universe for half of your life. There is no word for the year your partner, who you were with for 17 years, has been dead for 17 years. Language hasn’t given us an easy way to describe the year when your daughter, who graced the earth for 12 years, has been gone for 12 years. Yet these moments are significant; it feels like they warrant their own titles. Like so many things in grief, they mark the strange passage of time. They bring an acute awareness to that feeling that something was both just yesterday and a lifetime ago. They remind us that the impact of even the shortest of lives can reverberate years, decades, generations into the future. Short of a beer and a piece of coconut cake, I don’t have an annual ritual or tradition for my dad’s deathiversary. I always mark it in some way, but the shape that takes varies (which I feel absolutely fine about – ritual can be a lot more flexible than you might think). This year I wasn’t sure what I should do, but it somehow felt like it should be bigger than usual, or especially significant to mark this yet-unnamed half and half year. I wish I could say I immediately knew what I should do with the day. As usual, I hoped I’d have some clear idea about how I should spend the day that would somehow feel right or bring some comfort or appropriately mark this deathiversary-plus. But I had no clear idea, nothing inspiring or obvious. That isn’t usually how it goes for this girl, who once wrote an entire post on how to spend the day sulking like a professional. Unfortunately, my coping rarely comes to me in flashes of inspiration that launch me into action. It usually comes through reflecting and pushing and doing things even when they’re hard and even when I’m not sure they’re going to help or be the right thing. It isn’t always easy and it certainly doesn’t always happen with a smile on my face. But it happens, and that’s what matters. 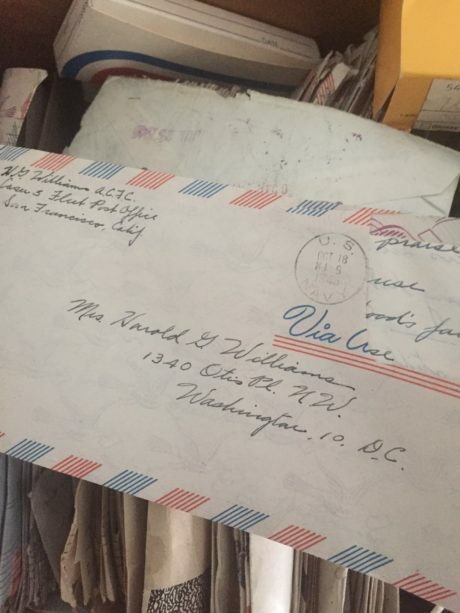 On the morning of June 26th I opened a box of old letters (you may remember these letters from my post about them over on photogrief) and grabbed one, addressed in an age before zip codes. I started the 30 mile trip south from Baltimore to DC, the city where my dad was born in a house I had heard about but had never seen. His parents moved out of this house when he was young, buying a new home just outside the city line. That was the home I knew, the one my grandmother still lived in when I was a child, the one I cleaned out after both she and my dad were gone. As I drove down to DC I realized I was going to pass that neighborhood, the one where my dad spent his later childhood and teenage years. 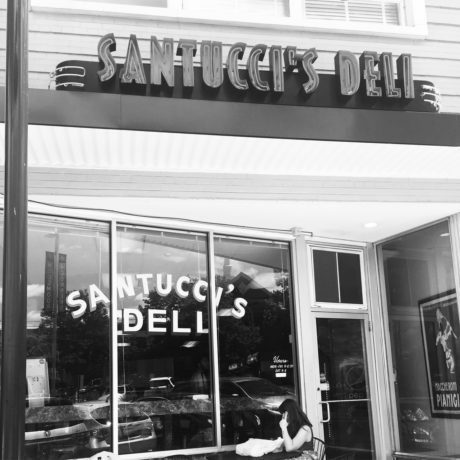 The route unexpectedly took me right by the deli where he worked in high school. It only seemed appropriate to stop off for a sandwich. Word on the street: not much has changed since my dad worked there in 1962. When I finally parked my car on Otis Place I was looking at a classic snapshot of the DC of 2017 that I know all too well. 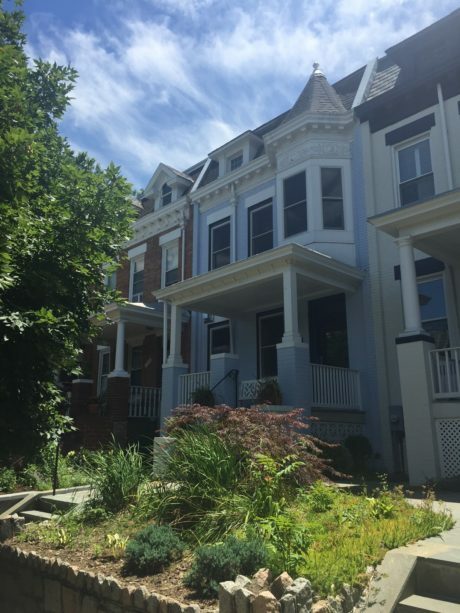 It was no longer the neighborhood my dad had once said was “too unsafe to visit”, and I felt the pang of sadness that he wasn’t here to see this change, to debate the ins and outs of gentrification with me. It would have been a great discussion, I’m sure. I walked down the block and thought of my grandparents walking down the same street, thought of the mailman delivering all those letters sent to my grandmother by my grandfather when he was in the war, letters that now live in a large box in my basement. I followed the numbers up the block and found the house, beautifully painted and impeccably landscaped. It looked too fancy now to have been a house my father and grandparents lived in, grand in comparison to the small 1950s style cottage they settled in just outside the DC city line. I stood there, a bit awkwardly, looking up at the house and wondered what to do with myself. So I did what any red-blooded American does in 2017 – I pulled out my phone and snapped a photo. I took one last look and made my way slowly home, with stops for some time in a coffee shop and a park, with a book, and for some beer and coconut cake. I suspect the ending one would want to this post is for me to say it was the perfect way to spend the day and that it brought exactly the peace and comfort I wanted for this half-and-half-iversary (hmmmm that doesn’t really roll off the tongue, does it?). I could say that, and it would be mostly true. It was a really nice way to spend the day. I felt a sense of purpose and direction that was comforting and there were some moments of deep peace. It was what the best grief-y days are for me: happy and sad, full of memories, time to myself, and time to reflect. Would it be the right day for everyone? Of course not. But grief is about finding the ways to cope, remember, and connect that work for you, big or small. And it’s about knowing it doesn’t have to be perfect to be a good day. Don’t forget to subscribe to get new posts right to your inbox! Keep the conversation going by leaving a comment, especially if you have a good word for these half-and-half-iversaries or a good story to share of how you have spent a meaningful day. 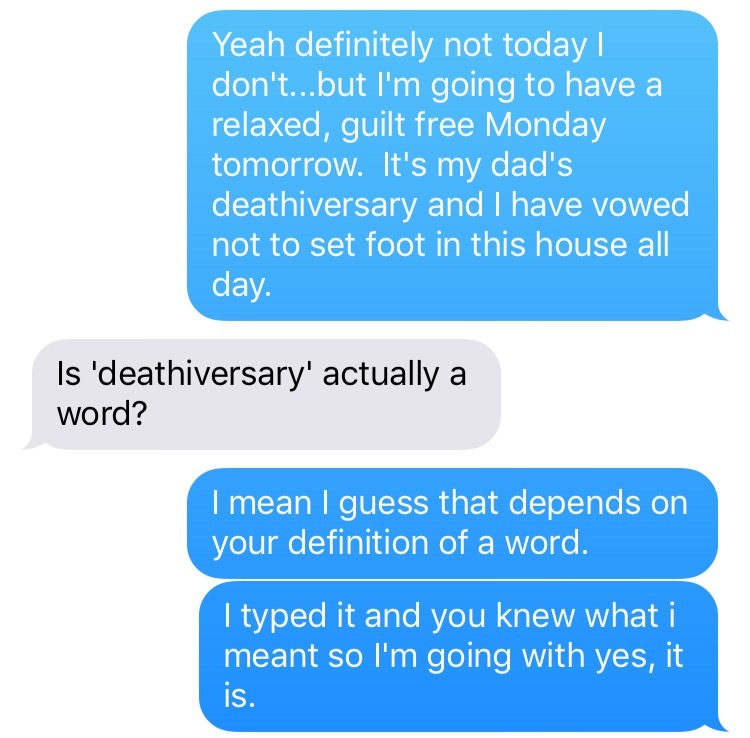 14 responses on "Is 'Deathiversary' Actually A Word?" The 24th of February will be the 5 year anniversary of my brothers death. We usually have done a sushi dinner in his honor, always setting a place for him. This time, we plan on having a big party. He loved reggae music so it will be Jamaican themed. I really hope to get his face on a cake. It’ll be just like a birthday party. We will invite all his friends and everyone who’s lives he’s touched. The plan is to celebrate who he was and the love we still have for him in our hearts. Because he still seems very real to us, even though he’s gone. August 13, 2009… I left my beloved summer camp for the last time. The hills were my heaven-on-earth, my refuge, my true home where the heart is. It’ll be 10 years this year. My family doesn’t get it and I don’t have a lot of friends, only one of whom understands (spoiler alert, they were my bunkmate… but they live in another state). For lack of a better word, I call August 13 the “endiversary.” It’s a different sort of grief, but grief nonetheless. Our widow’s group uses the term Angel-versary as it puts a positive spin on this sad day. Perspectives like, he didn’t just die; he gained his wings. Or, he’s the angel looking after me. And, he’s with Our Lord, enjoying Heaven until I get there. We acknowledge our loss but also recognize his always being with us in spirit. Great insight! I lost my Father, Mother-in-law, Mother and Husband within 4 years time. I remember each of them on their death days with something which we shared. And…it doesn’t seem that it will ever go away, at least with my husband. We would have just celebrated our 30th wedding anniversary on September 4th. And while he’s been gone over 12 years, it still hurts. I found some friends and toasted with his favorite cheap brandy. Whatever you need to do…do it. Deathiversary, sadiversary, angelversary … I’ve used these and others. Sometimes I’ve simply called it That Day, thinking of it as the pivot point between my life before and after. I’m sorry about your dad’s death so early in your life. It hurts. It has been 22 years since my mom’s passing, and I still miss her with a ferocity that intensifies around her deathiversary and her birthday as well as my own. In Judaism this date is called the yartzeit. A particular prayer is said in community, and the person is remembered by all. This remembering is a core pat of jewish observance . I hate all the platitudes, I say it is my brother’s death Day just like Birthday. On the day he ended his life ( had stage 4 cancer and chose his way out) he took my mom and I to a casino, had a reservation at Ruth’s Chris steakhouse( our fav) he actually ate a little, had his favorite dessert crime brûlée, gambled a little, went home and watched his favorite movie, then he did it with us at his side. On his death day ( first one last year) I had a friend that came with me and we repeated it all, meal, gambling, movie. Although it was incredibly sad at times it gave me comfort because he planned it all for himself. I believe I will try every year to do this. I’m marking my mother’s death anniversary this week. I’ve gone to her home every year, and this year I blogged about death month. Thanks for sharing your experience. Great job defining the trouble with these sorts of days. I loved your story and could feel myself traveling with you.